Pakistan - Dominant in T20s! 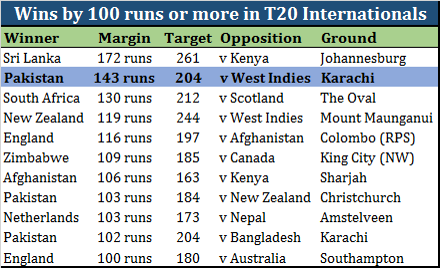 If you blinked during last week, you probably missed the 3-match T20 series between Pakistan and the West Indies that was played in Karachi. Yes, Karachi finally hosted international cricket after 10 years, and it was a welcome return for international cricket to Pakistan. The series ended up being a cake walk for Pakistan as the West Indies were missing most of their big players, resulting in a whopping 3-0 thrashing by Pakistan. During the series, Pakistan registered two of their highest ever T20I scores of 205-3 and 203-5. They also registered their biggest win in T20Is (by 143 runs), which is also the second biggest win by runs ever in all T20Is and the biggest in a game between two test playing nations. 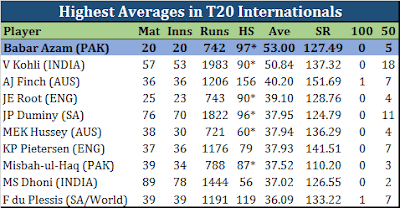 Interesting to note that Pakistan feature in this table above on three different occasions with all three T20Is played against test playing nations! No wonder they are the number 1 ranked team in T20Is. 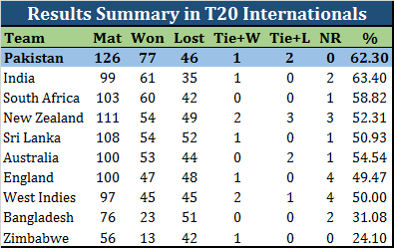 Pakistan truly deserve their number 1 ranking in T20Is given they have won more T20 internationals than any other team in the world and that they are one of the only two teams that have a T20 win percentage higher than 60%. The man of the series in the just concluded Pakistan vs West Indies series was Babar Azam, Pakistan's brightest batting talent. Babar notched up scores of 17, 97*, and 51, which propelled him to number 1 in ICC's rankings for batsmen in T20s. Babar currently possesses the highest average in T20Is among all batsmen, which is more than 2 runs higher than Virat Kohli's. 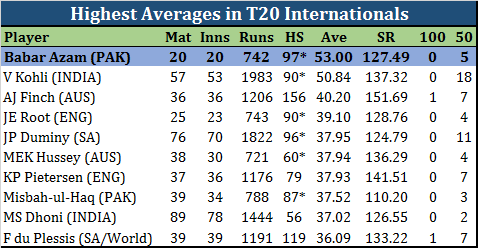 Babar and Kohli are the only two batsmen who average above 50 in T20Is (among batsmen with at least 10 innings) and also the only two batsmen in the world who have an average above 50 in both ODIs and T20Is. 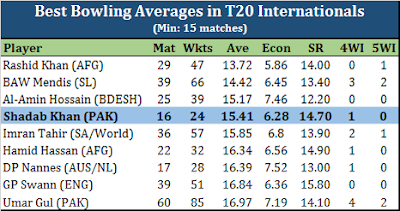 Shadab Khan, Pakistan's young leg spinner, also rose in the rankings to number 2 among bowlers in T20Is. 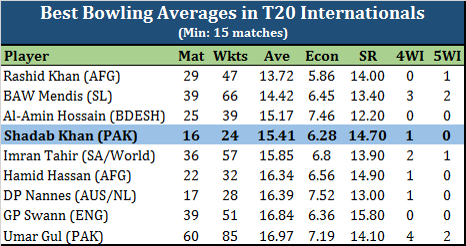 Shadab has an enviable record on T20Is with 24 wickets in 16 matches with an average of 15.4, which is the 4th best average ever in T20Is among all bowlers who have played a minimum of 15 T20 internationals. Pakistan did well by blooding some new players during the series. Hussain Talat had an awesome run in the 3 T20Is and he looks like a future batting star already. The left hander notched up 135 runs in the 3 games, which was the second highest tally in the series, behind only Babar Azam. It was quite a promising debut for Hussain Talat in the first T20I of the series where he scored 41, took 3 catches, and also took a wicket with his 4th delivery in international cricket. His 3 catches on debut was a T20I record and he also became only the third Pakistani, after Shahid Afridi and Shadab Khan, to pick up a man of the match award on T20 debut. Pakistan are the number 1 T20 team in the world and they are the winners of the Champions Trophy making them one of the best, if not the best, limited overs team around these days. Pakistan possess some fine young talent for limited overs. Besides Babar and Shadab, the likes of Fakhar Zaman, Hassan Ali, and Faheem Ashraf are stars in the making. With senior pros like captian Sarfraz Ahmed, Shoaib Malik, and Mohammad Aamer this is one dangerous team in the making. Before signing off, here is one fact demonstrating Pakistan's dominance in T20Is, particularly under Sarfraz Ahmed. Since Sarfraz took over as captain of Pakistan's T20 team in 2016, Pakistan have not lost a bilateral T20I series. This win over the West Indies was Pakistan's 7th consecutive series win in T20Is! And in 4 of those series, Pakistan did not lose a single T20I! In the past 2 years under Sarfraz' captaincy, Pakistan have beaten England 1-0, West Indies thrice 3-0, 3-1, and 3-0, World XI 2-1, Sri Lanka 3-0, and New Zealand 2-1. Great times ahead for this Pakistan team in Green!